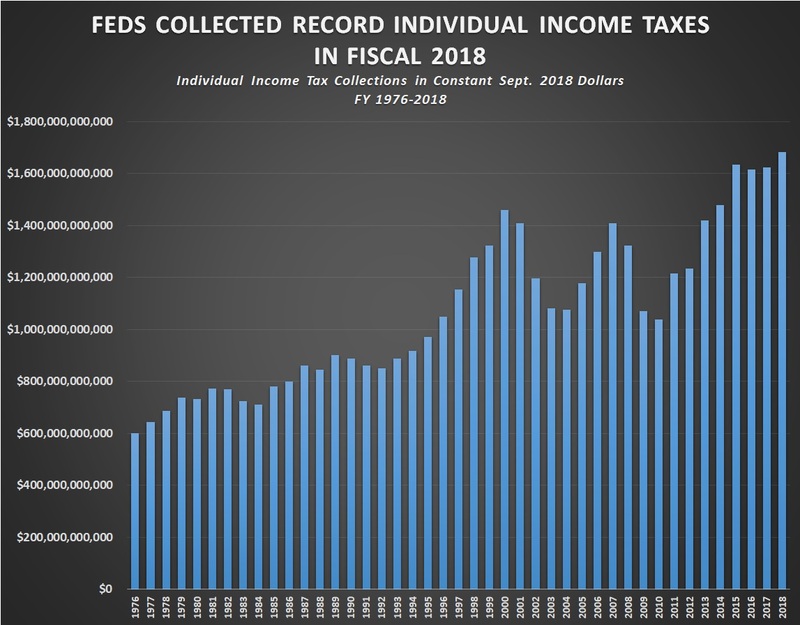 The U.S. federal government set a record in individual income tax revenue in 2018, collecting more than $1.683 trillion from taxpayers, according to the Monthly Treasury Statement released this month. The period reflects the government’s fiscal year, which runs from October 2017 to September 2018. However, while the government collected more revenue from taxpayers in history, it ran a nearly $800 billion deficit. 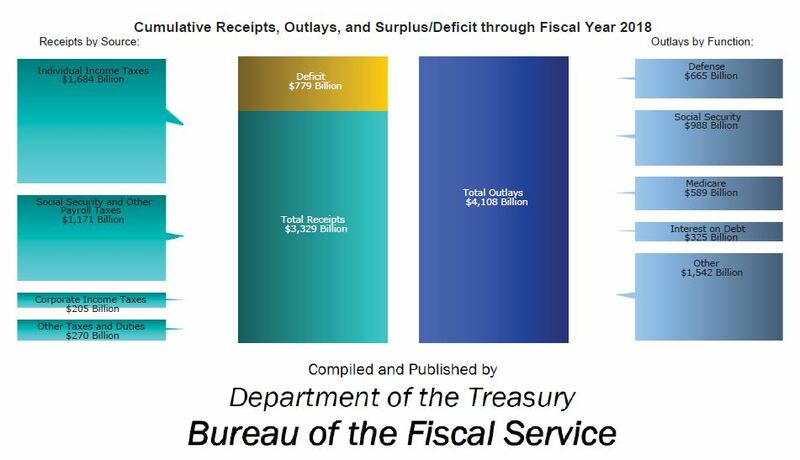 DISCUSS IN THE FORUM: For many years, the U.S. government has spent more money than it has taken in revenue from taxpayers. Democratic and Republican administrations (as well as congressional leaders) have been responsible. However, the constant stream of deficit spending may be starting to reach a boiling point. Can the government sustain its current level of spending? If so, for how much longer? And what is the short-term, and long-term project for government contractors who are growing their businesses due to increased spending. Click here to discuss. Revenues from individual tax payers keep setting records: Following a sharp decline in revenue during the Great Recession, taxpayers have been filling the government’s coffers with record, or near-record, revenue every year since 2013. The last 4 fiscal years have seen revenue north of $1.6 trillion, with the last fiscal year breaking the previous record set in 2015. On the flip side… Total revenues are down: Despite the record amount collected in individual income taxes in fiscal 2018, overall real federal tax revenues in fiscal 2018 were down. In fact, total tax revenue is lower than the previous three years. This decline in total tax revenue represents a trend that was apparent in the Obama administration, and has continued into the Trump administration. One of the factors contributing to this has been the decline in corporate tax collections. Though corporate taxes do not generate as much revenue as individual taxes (with many small business owners paying taxes as individuals), or off-set the budget deficit in a meaningful way, the decline has played a role in the total decline of revenue to the U.S. government. Based on this data from the Treasury Department, we can see that the decline in corporate tax revenue was a factor in 2016 (Obama’s last year in office) and 2017 (part of Obama’s last fiscal year). The decline in corporate tax revenues in 2018 has been significant. In fact, corporate taxes in 2018 have declined by more than 1/3 from the same total 2 years ago. This has taken place, while collections from individual tax payers have increased each of the last three years – leading up to 2018’s record year. Spend-zone: Not since the mid to late-1990s, following Ross Perot’s push to balance the budget (made famous during his presidential campaign, and his use of charts showing the growth of the national debt), has the government balanced the budget and had a revenue surplus. Spending and deficits have since gone hand in hand. Here is a chart that breaks-down receipts / revenue by source, total outlays, and then outlays by function (Credit CNS News). Mountain of debt keeps growing: According to official data published by the U.S. Treasury Department, the debt of the federal government (not the deficit) increased by $1.27 trillion in 2018 (government’s fiscal year). The national debt currently stands at over $21 trillion, which is up from $4 trillion in 1992 (an increase of $17 trillion in less than 30 years). One of the challenges with both the national debt and spending growing, and interest rates on the rise, will be the higher interest payments on the money borrowed to fund the government. Interest payments could exceed $600 billion by 2020 election, depending on how much new spending is authorized and whether or not the Federal Reserve raises interest rates to combat inflation. Some current projections have interest payments surpassing the entire defense budget (all military spending) within less than 10 years.